I’ve begun to think of myself like the amethyst I’ve got on my shelf. 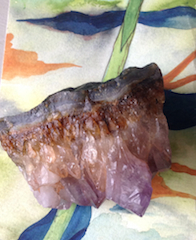 Pretty craggy and old on the outside but shiny and multi-faceted within. I’ve had the particular stone pictured here for years – it needed dusting off. But now it’s sparkling again. Last Autumn, after taking two courses with Kathy Fish – one weekend and one two week course – I decided to submit to literature magazines as well as to competitions. Since the end of last year, two pieces I wrote on those workshops have been accepted for magazines. (Many other people find this when they do a course with Kathy – it’s magic how she gets writers going). I have a micro in the December 2015 issue of Flash Frontier. Last week, a longer flash fiction of mine was accepted for the inaugural issue of Halo Literary Magazine. And these are the first two non-competition pieces I’ve ever sent out, apart from ones submitted to Visual Verse each month. So what can I learn from this? The obvious thing is that I have to keep sending my fiction into the world if I want it to be read by others. Competitions, magazines – whatever. And it doesn’t matter how old I am. I can still carry on developing – be a really, really late developer. Editors out there are focused on the writing, not the age of the writer. Previous Previous post: Should writing fiction be all about fun?